Hi friends, Layle here! It's been almost 4 months now since I've been at Simple Stories as the new Marketing Director. Since that very first day I started back in April, I've been watching our new products come to life and now we're finally here! Welcome to the Simple Stories CHA Summer Sneak Peek Week! Boy do we have some treats in store for you this week, including 3 brand new collections, a new suite of products called SN@P! Sets in 8 themes that will make you positively GIDDY, and a new color added to our family of SN@P! Binders. Speaking of when you can buy it - we'll be shipping to retailers in early August, so you won't have to wait long to get your hands on the new Simple Stories goodness! Our new Say Cheese collection is guaranteed to have you smiling from ear to ear! With magical papers & dreamy embellishments, Say Cheese is just the ticket for documenting those happy moments with the whole gang, including the 'Big Cheese' himself! FUN - I know, right?! With our 3 new main releases, we've made a fun change to our Basics papers - you now have a color coordinated tonal pattern on the back vs. the general cream and white notebook papers we've done in the past. Love it! Remember earlier I mentioned we have a NEW! color in our SN@P! Binder album family? BLACK! With 3x4 and 4x6 sizes, our SN@P! Cuts are designed to easily slide right into our Pocket Pages. They're also great for adding to layouts and cards as well. How about all of these FABULOUS 4x6 and 3x4 cards?! So many great designs. Click on the image below to get a closer look! Speaking of cards, how about these fun new cards created by Shellye McDaniel?! For those of you heading to your favorite amusement park this summer, this 4x6 spiral bound Autograph Album with 12 pages and 12 Pocket Pages for inserting photos is a fun way to capture your magical photos and autographs from all your favorite characters, including the 'Big Cheese' himself! Here's what it looks like after Vicki Boutin added a little bakers twine and gems to the cover and added a photo along with an autograph from the 'big cheese' himself - easy peezy! For one last reveal today - we're beyond thrilled to announce that once again, Simple Stories and Scrapbook Generation have joined forces to introduce a new exclusive idea book, Sketch Magic with Simple Stories, featuring all-new sketch blueprints that blend perfectly with the unique format of Simple Stories papers and signature elements for quick and creative scrapbooking! Now's the fun part - we're giving away one Say Cheese collection goodie pack and one Sketch Magic book. Simply let us know what you think of our first sneak peek by posting a comment and you'll be entered to win! We'll leave comments open until July 30th and announce the random lucky winners on July 31st! Absolutely Adorable! I can't wait for the release and I may just have to schedule the next vacation to the big D park! AND the black SN@P album makes me swoon! LOVE IT! I love all the different cards and bright inspiration pages! There is so much to LOVE about this entire collection! I just returned from DW & Animal Kingdom, so I know what kit I'm using for those pages! Love it all! So cute! Knocked this one out the park! Love the Snap products and way to go with the autograph album already assembled and ready to go for a great vacation. I love every piece of the new collection, Say Cheese. Wow I love it! I already guessed it would fit perfect with our october plans to visit the big cheese in Paris, but it's even better than I hoped! My boys would be so happy with the little autograph book. 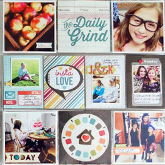 Simple stories thank you again for making this beuatiful scrapbook goodies! Well this is all kinds of wonderful! I love that it's a cool Disney line - not too cheesy and not just for kids! DH and I celebrated his 50th at Disney earlier this year and I need to do a mini album for it. So glad I procrastinated! Can't wait to get my hands on this! Very fun and bright collection! Love it! I love it and can't wait to use it. I have a set of photos that will be just perfect! This is awesome!!! LOVE LOVE LOVE it! I love the colours in this new line and the theme. It was nice to see the line used not only for vacation like themes but also for just everyday activities...very nice! Can't wait for this one, I am just about to take an albums worth of Disney photos out of an old sticky page album and re do them. Love Disney World and love Simpke Stories = very excited about this collection!!! The colors and embellishments are awesome! You make saving memories so much fun! Oh goodness. This is an amazing sneak! I love how versatile this line is. We can definitely use it for our Disney trips and it'll scream Mickey or we can use it on our every day layouts - love! My favorite are the letter stickers and the cut out cards. Love, Love Love it!! Perfect for all of our memories or our favorite place on earth!! And perfect timing for our trip this fall! Love the whole collection!!!! The colours are awesome. Love the Sketch Magic book!!!! Swoon! Love love love! Such great colors and versatile! I need to get my hands on this ASAP!!! I am loving it! As soon as I saw the sneak I told my hubby to get ready we are headed back to Disney World!!! I will have to have doubles of almost everything and I will save it for my next trip! This is just too cute! I love all the little embellies! Perfect for our trip to WDW this summer! Oh wow love this collection so much! Love love love it! Wow wow wow wow!! What an AWESOME collection! I am IN LOVE with the colors!!! This made my day! Completely adorable! I have so many Disney pictures and now I have a plan for what to do with them. Thank you for the magical collection! I love it. I like how iconic it is without being cartoony. Awesome!! We went to Disney last summer and this kit would be great. I can't wait to get my hands on it. And the sketch book looks awesome. Love those books! And this kit! I love it, i love it, I LOVE IT!!!!!!!!!! Oohh--I like this collection! So exciting! I have been looking forward to this... And it didn't disappoint!!! I love everything about it... Can't wait for it to hit the stores! I love this collection! The red/yellow/black would be great for many different themes! This is perfect! I'll be combining this with the new 12x12 albums to finally get my years of Disney photos in order. I have been seriously nervous trying to figure out how to scrap our Disney trip in April for three people. You have just made it easy :) thank you so much. Oh, this is fun! I Can't wait to play with this collection! OH, My... how magical! As a self proclaimed Disney fan, I Love this collection! What fun! And Scrapbook Generation is just the icing on the cake! Wow this looks amazing! I'm almost glad I don't have my Disney trip scrapped. I guess I was just waiting for this great line! WOW! I need the whole collection now!!! It's just perfect for an album I have in mind of our previous trips to WDW. I have a pack of Disney pictures from 10 years ago sitting and waiting. This line could put these pictures into an album and out where we can enjoy them! Thank you so much for another awesome line! I can't wait!! Oh my gosh! I love this! So cute! We are taking our first trip to Disney this fall, and I will NEED this collection and those autograph books for our girls! Such a cute and fun line! Love it! My favorite is the "Fun" paper! Thanks for the chance! LOVE this whole collection!! My whole family is planning a Disney trip next year...this line is a MUST HAVE!! I love this collection! I especially love how it is versatile enough to be used for everyday photos too. Beautiful colors! I'm so looking forward until this collection hits the store :) Loved the colours and I can't wait to PL with them!!! What a start - will follow closely the rest!!! I love the colors and the patterns and that it isn't specific to all Disney, for those of us who have never been to one of those theme parks. I could see this used so easily in Project LIfe or grandson pages! Can't wait to see what is next! Oh boy! I can now be happy that I put off scrapping the pictures fro the trip to Walt Disney (in 2007). This line ensure that those pictures will finally make it into an album. Thanks for the chance to win. You guys are so SNEAKY!!! I love how it can be used for Disney pictures BUT it has the versatility to be used for anything. Love, Love, love this collection! There are so many possibilities. I was so excited when I saw it. I love the cards, they are so versatile for different projects. My very favorite thing was the old photo wheel, it took me back to my childhood. Great collection! Love the addition of the light blue so it's not just a Disney line! What a cute collection. I love the new snap elements! looks great, thanks for the chance to win. Love the new line!! Can't wait to get it!! Love the new collection! It is great for Disney, but so versatile it could be used for pretty much anything! You reeled me in with those colors and then I thought OH NO--its just for Disney people. But at a closer look I realized HECK NO--I can use this for anything-DUH!!! Love, LOve, Love this collection! Can't wait to get this for my Disneyworld pictures! Thanks for the chance! Thank you for this fabulous line!! The Basics kit is just as wonderful as the Say Cheese colection. This goes to my must have list..
Love everything about it. While it is perfect for visiting the Mouse, it could be used for other travels as well. Great ideas! I love this! Such a versatile line, not just for theme parks! Love the whole collection, especially the neutral pack. Can't wait to see what Allison and Debbie have created in their book. They've done all the work for you with the help of SS products. I have planned my first visit to Disney World in 2014 and this collection is perfect!! I love this! Colors are so great! Once again, you've knocked it out of the park! LOVE this set & it's versatility! These papers are so awesome for my Disney pics. Love, love, love! And another SG book...amaze balls! Good luck everyone! So loving this! It would be perfect to document my upcoming Disney cruise in November. Love this collection it's beautiful! We are taking the girls to Disney for the first time in February! This collection is PERFECT for our photos! This stuff is awesome! I'm going to use it for the Disney Honeymoon album I'm finally going to start fourteen years after the fact. Omigoodness....YESSSSS!!!!! This collection would be absolutely PERFECT for the stack of Disney World photos I have from 2009! MUST.HAVE. Love it, love it, love it. Simple Stories has, once again, outdone itself. My daughter is heading to Disney for the Disney College Program and the Simple Stories Say Cheese collection would be perfect to remember this wonderful time in her life!!! I just have to have the entire line!!! Great job Simple Stories!! I love it!! The colors are perfect and I am excited to be able to also use it with general scrapbooking too, not just Disneyland! I love the bright colors with the black, so stunning! So cute! Although at first glance, it gives a very mickey mouse feel, but I'm quite sure it'd be perfect to document my upcoming performance! ^^ Love the snap! cuts the most for this line! SO. MUCH. FUN.!! We are going to Disney next year and I will love to use this adorable line to document our trip. Thanks for the chance to win! I think it's just magical Ha... It's screaming LET Me help you document and who am I to say no?! Thanks for the chance. Love this, as always there is no disappointment in the Simple Stories line, love how this is designed for Disney but is yet versatile for any other use. Magical! Love it! :) Thanks for the chance to win! OH MY! Love the Magic of this line -it's Disney but NOT Disney - love the versatility of this one! This is Scrapbook Magic!! SS and SG teaming up together again! Love the MAGIC collection, can't wait to get my hands on this. Absolutely LOVE this new line!!!!! I can't wait to use it on everyday layouts and for gifting to my scrappy friends who go to Disney, but are always stuck when scrapping Disney! A perfect well designed line! LOVE it - You have done it again, Simple Stories!! More proof why you are my favorite manufacturer right now - just collection after collection of good stuff!! I luv the colors in this collection! Cant wait to get my hands on it. Thanks for the chance to win it. I love it!! This line will be perfect for our Disney trip in December. I could create Magic with this!!!! LOVE!!! Love the color combo - It seems so versatile yet could be so specific to certain events - I just love what you guys do - IT IS AWESOME!!! Great collection!! Love those pockets! Wow! This set is perfect for the special place all children love!! Love the colorful papers and embellishments!! Oh I love it! This would be PERFECT to document our upcoming Disney vacation! Cute, cute, cute! I love this collection!